Chart based on 63 repairs. 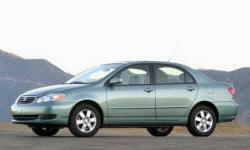 See TSBs and recalls for the 2008 Toyota Corolla. Chart based on 54 repair trips. The repair cost chart excludes repairs made under warranty, do-it-yourself repairs, and repair trips that include maintenance. C $1000 The car kept shutting off on me when I would brake or slow down. They said it was the computer that needed to be replaced. 36208 mi Car goes in to get the sunroof to get fixed for the third time. Sunroof rattles when you close it. They said they put in almost 3 000$CAD of parts to fix it. US $98 Plastic cover came loose under the car and rubbed against brakes. US $700 2 bad coils replaced, fuel system cleaned. US $120 Had to replace the washer motor. Mechanic suspects this was caused by using Rain-X fluid (FYI). 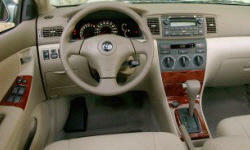 US $300 Replace serpentine drive belt and battery. 21080 mi no repairs, though there is an issue with the front brakes. After changing direction and braking, the brakes make banging noises. The service rep said it was OK - due to larger calipers. I let it go, but the next time I'll have them fix it. C $200 Oil leaking on the front side of the panel. Dealer replaced an oil seal and the front panel of the oil carter. Problem fixed. Dealer also put new oil as part of the process. This car is a frickin' rock.. US $750 Air conditioning hasn't worked in two years. Compressor replaced. 48860 mi The clutch started squeaking. The noise seemed to come from clutch release cylinder, but dealer deemed that the noise is coming from clutch release fork. 51860 mi Clutch release fork has to be lubricated again. The Don Valley North Toyota dealer is one of the worst, they lubricated the fork in June and the job need to be done again after few months. Went to different dealer. 66960 mi Water pump failled. Replaces with new one. 67160 mi The gas tank shield got dismounted making a loud banging noise under the car. Fixed with new screw -pretty easy procedure but need to go under the car very uncomfortable without proper lifting. C $5 Timing chain tensioner leaking oil (very common problem). Easy DIY. 35900 mi Both rear door seals were shrinking away from the car's body as if the rubber compound they were made of had been formulated wrong chemically. Serpentine belt tensioner replaced under warranty. Wheel balance to correct steering wheel vibe. 49000 mi Serpentine belt tensioner had been replaced under warranty at 36000 miles. Now at 49000 miles, the tensioner is again not putting correct tension on belt. This is a very common problem with the 1zz-FE engine in 2003-2008 corollas. 59500 mi This car has had a steering wheel vibration since purchased new. Have had wheels balanced 4 times by 3 different shops. New tires were tried. 4 wheel allignment was done. Vibration is independant of gear, engine RPM, and braking. US $5282 Engine threw a rod at 66,130 while on freeway. Vehicle had been maintained by Toyota specifications. A 2 inch X 3 inch hole was knocked out of the engine block. US $98 Replace battery. One cell was dead on old one. US $250 The horn didn't work. A wire had come loose. 57000 mi Blown head gasket. Don't know if top or bottom. Traded into dealer as is and bought new car. US $40 Valve cover gasket had a minor leak. I replaced it myself. US $450 Need new front brake pads, rotors, and new calipers. The caliper froze and was wearing out the breaks. US $289 Oil pan gasket needed to be replace. Mechanic said much better to replace whole pan. US $250 Replace serpentine belt idler. Well-known Corolla problem. Timing belt tensioner leaking oil. Well-known Corolla problem. US $600 Engine management unit (computer) replaced. EMU was only a few years old since it had been replaced by a recall. 68000 mi Common repair for 2003-2008 Corollas. Replace Computer which fixed rough idling and poor auto. shifting. US $450 Front left brake caliper locked up. Replaced it along with all four worn brakes. US $69 The engine splash shield lost some bolts and was dragging on the ground. I found a shop (Mr. Tire) that wasn't busy and they replaced the bolts in about half an hour. $69. If I had a lift or ramps I could have probably done it myself. US $39 The heat shield covering the bottom of the engine lost a bolt and made a LOUD rattle. They replaced the bolt and it's fine now. Only took a few minutes. US $987 Had fluid leaking from transmission. Also oil leaking. Also power steering fluid leaking. They also said the serpentine belt needed replacing. US $850 Steering was tight and car bounced excessively on rough road. Changed all four struts, front sway links and had wheels re-aligned. 37200 mi Spring or bolt from the heatshield under the gas tank fell off causing the heatshield to land on the muffler tubes map light does not stay on. dealer stated that there was corrosion on the wires. US $150 Battery was totally drained. Vehicle was not used for 2 months. 14880 mi clunk being experienced when first braking; issue is a slight gap between pad/caliper. no change required except new pads recommend after 15000km. Gear shift a bit sticky; links lubed and issue disappeared. See our lemon odds and nada odds page to see vehicles with no repairs or vehicles with more than three repairs. To see how frequently 2008 Toyota Corolla problems occur, check out our car reliability stats.